Posted: Wed Nov 09, 2016 4:19 pm Does my turtle look okay? I'm 13 and my mom pays for all the turtle stuff and she says my turtle is happy and healthy. Posted: Thu Nov 10, 2016 9:24 am Re: Does my turtle look okay? I can't tell much from the picture but it does look like very excessive growth... so you're overfeeding way too much. Posted: Thu Nov 10, 2016 5:31 pm Re: Does my turtle look okay? steve wrote: I can't tell much from the picture but it does look like very excessive growth... so you're overfeeding way too much. Yes at the time I was only feeding pellets daily but now I feed her lettuce and and pellets weekly and her growing as slowed down much more. When I was feeding her pellets she showed no shoulder swelling but she grew fast to 3 inches but its good now because she slowed down. Posted: Fri Nov 11, 2016 10:30 pm Re: Does my turtle look okay? By "shoulder swelling" you mean fat? Posted: Sat Nov 12, 2016 12:10 pm Re: Does my turtle look okay? steve wrote: By "shoulder swelling" you mean fat? Posted: Sat Nov 12, 2016 2:10 pm Re: Does my turtle look okay? If you get a new pill box (they sort out medicine) and you can plan out the pellets your RES gets. Makes it easier to not overfeed. 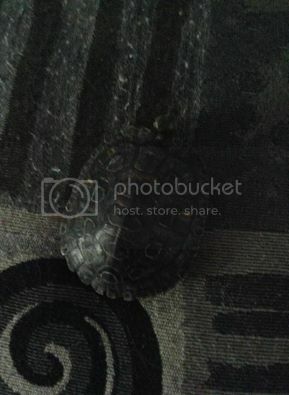 Posted: Sun Nov 13, 2016 7:53 am Re: Does my turtle look okay? steve wrote: If you get a new pill box (they sort out medicine) and you can plan out the pellets your RES gets. Makes it easier to not overfeed. Posted: Sun Nov 13, 2016 2:18 pm Re: Does my turtle look okay? 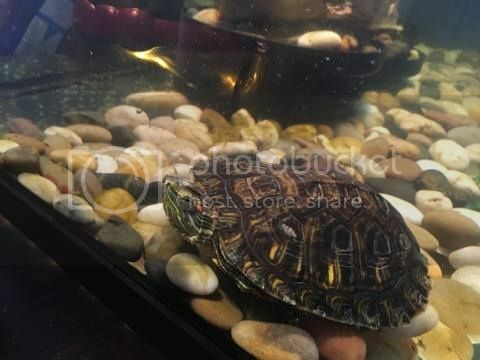 Posted: Sun Nov 13, 2016 2:25 pm Re: Does my turtle look okay? Posted: Sun Nov 13, 2016 4:12 pm Re: Does my turtle look okay? Posted: Sun Nov 13, 2016 7:37 pm Re: Does my turtle look okay? Posted: Sat Jan 07, 2017 3:09 pm Re: Does my turtle look okay? New pic!!! I'd show the whole setup up my sister only let me use her phone for 1 pic! Posted: Sun Jan 08, 2017 1:14 am Re: Does my turtle look okay? i had to edit your post to show the picture. When you use photobucket, under "SHARE THIS PHOTO" just click IMG once and paste into your reply. Is he still around 3"? Posted: Sun Jan 08, 2017 8:51 am Re: Does my turtle look okay? steve wrote: i had to edit your post to show the picture. When you use photobucket, under "SHARE THIS PHOTO" just click IMG once and paste into your reply. Is he still around 3"? I think around 3 inches? Not sure. Posted: Sun Jan 08, 2017 8:59 am Re: Does my turtle look okay?